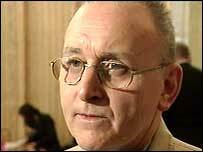 Veteran Sinn Fein official Denis Donaldson has admitted he was a paid British agent for two decades. Here is his statement in full, which he made to Irish broadcaster RTE at a Dublin hotel. "My name is Denis Donaldson. I worked as the Sinn Fein Assembly group administrator in Parliament Buildings at the time of the PSNI raid on the Sinn Fein offices in October 2002, the so-called Stormontgate affair. "I was a British agent at the time. "I was recruited in the 1980s after compromising myself during a vulnerable time in my life. "Since then, I have worked for British intelligence and the RUC/PSNI Special Branch. Over that period I was paid money. "My last two contacts with Special Branch were as follows: two days before my arrest in October 2002, and last night, when a member of Special Branch contacted me to arrange a meeting. "I was not involved in any republican spy ring at Stormont. "The so-called Stormontgate affair was a scam and a fiction. It never existed. It was created by Special Branch. "I deeply regret my activities with British intelligence and RUC/PSNI Special Branch. "I apologise to anyone who has suffered as a result of my activities as well as to my former comrades, and especially to my family who have become victims in all of this."